Today was the first day that I stepped outside and it actually felt like fall. There was a crispness in the air and the leaves are starting to turn. Life has been so crazy busy lately that it felt good to just stand there and take it all in. There's something about the change in seasons that makes me crave change. I have a hair appointment booked for next week and can't wait for a fresh, new cut. Kyle's brother & future sister in law are getting married this weekend and we've spent nearly all of summer getting his family farm ready for their celebration. I'm so excited to see it all come together! Then, next week, Kyle & I will be off to meet my family in Hawaii so I'm looking forward to some much needed rest & relaxation! 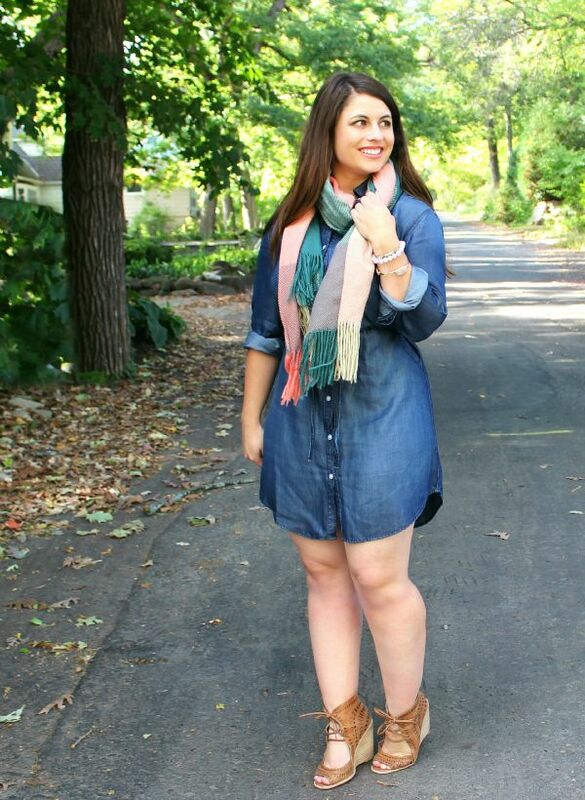 This denim dress is a perfect piece to transition into fall. When it gets colder I can layer on tights & ankle boots or a cute utility coat. For now, I'm rocking a cute pink & olive green plaid blanket scarf from last year (see how I styled it as a wrap here). 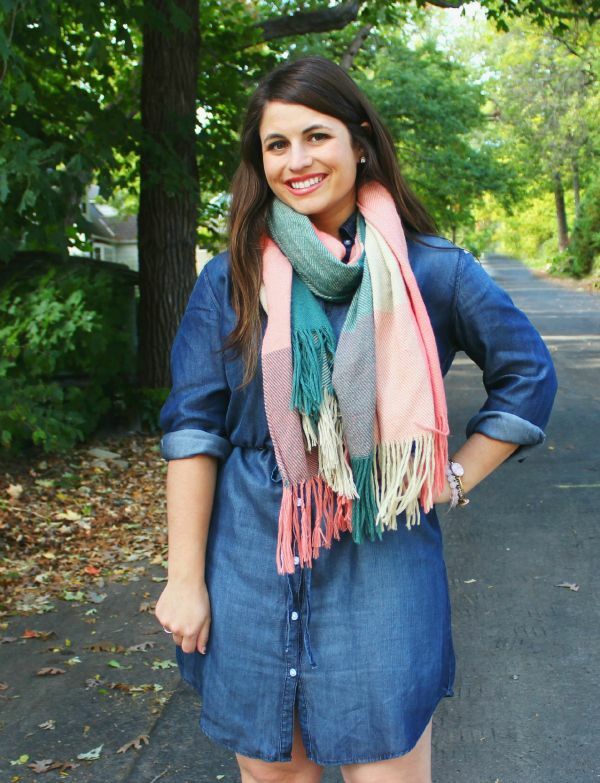 I'm all about denim in every shape & form for fall. 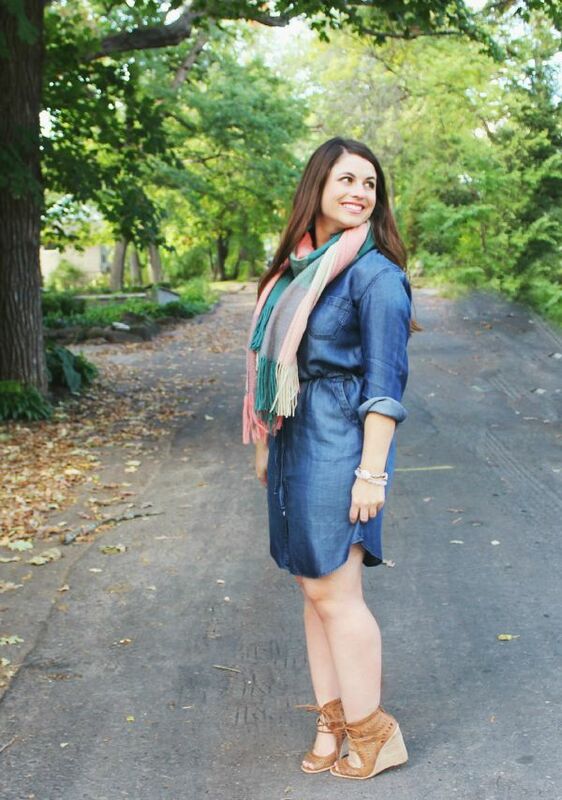 From dresses to chambray shirts to trusty blue jean- you really can't go wrong with any silhouette. It's one of the most versatile fabrics ever. I'm looking forward to taking this piece into colder weather! As a side note, I picked up these Jeffrey Campbell lace-up beauties this summer and they've become one of my favorites. They're super comfortable wedges and look oh-so-sassy paired with skinny jeans! This is so cute Lauren! 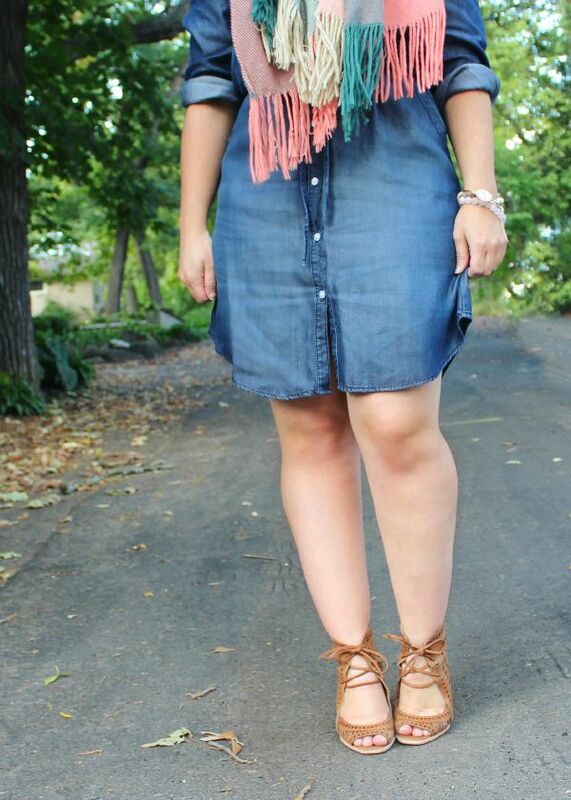 It's the perfect look for feeling fall but the weather still says we want summer! Such a perfect pre autumn outfit. 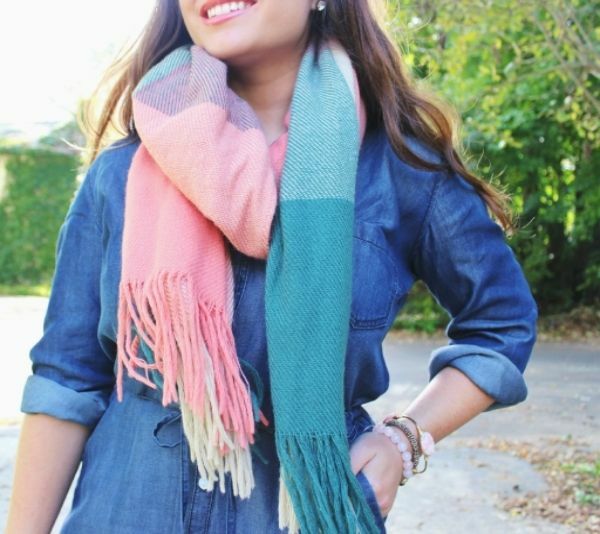 I love the denim here and that scarf is so perfect. We've had the cooler weather for a while now, so I got out my denim ages ago. Hi Lauren! I just discovered your great blog as I was desperately searching for some resources about petite shopping (I've had some lackluster shopping trips lately). Speaking of denim, one of my biggest challenges as a curvy petite woman is finding jeans that fit right. Do you have any go-to stores/brands for petite jeans? Thanks!